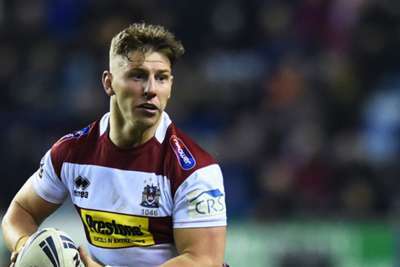 Wigan Warriors' miserable start to the Super League season received a welcome boost on Sunday as they beat Salford Red Devils 30-22. After one win in their first six matches and confusion around Shaun Edwards' supposed 2020 arrival, the defending champions arrived at the AJ Bell Stadium in need of a lift and George Williams' hat-trick provided that. He grabbed his first after 25 minutes as Wigan fought back from Josh Jones' early try, Thomas Leuluai and Joe Greenwood also scoring before half-time. But Salford were only two points behind at the break and Adam Walker's converted score gave them the lead early in the second half. Wigan were not to be denied, though, as Williams profited from two Joe Burgess breaks to complete his treble and give the Warriors a much-needed victory. 63' THREE TRIES FOR @George7Williams!! A slick pass by @OliverGildart3 finds @JoeBurgess1 who breaks down the left edge. Burgess finds the supporting Williams again and the stand-off finishes off the move! The win moves Wigan above Huddersfield in the table and within touching distance of the three sides above them. Hull FC moved away from that group with a 28-24 triumph over London Broncos, a result that moves them into the top five. The Broncos led by four points at half-time but were outscored by eight in the second period as Hull got back to winning ways after defeat to Wakefield Trinity last time out. Carlos Tuimavave, Jordan Thompson, Albert Kelly and Bureta Faraimo all scored in the space of 19 second-half minutes to turn the game Hull's way and deny the Broncos back-to-back wins for the first time since their return to Super League.